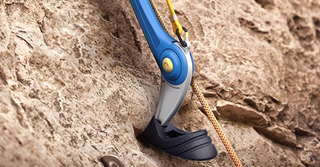 His latest creation, Klippa, is a prosthetic leg designed especially for rock climbers. Specifically, Lin has American veterans who have lost legs, but would like to continue or take up climbing, in mind. While standard prosthetic legs are designed for walking, they're inadequate for the needs of climbers: they lack the flexibility, articulation and small footprint required to make it up most rock faces. So Lin spent time interviewing climbers and examining exactly how their legs move. He figured that his leg needed a soft, but easily replaceable, rubber lining; an elastic, pivoted joint to provides proper ankle articulation; and a small contact patch to provide control and high grip. He even took a cue from nature, using the shape of a mountain goat's foot in place of a regular sole.